Based on the existence of workhouse accounts, St Margaret appears to have set up in a workhouse as early as 1692. The separate parish of St John the Evangelist was formed in 1727 from the southern part of the ancient parish of St Margaret. The two parishes continued to operate jointly in matters such as poor relief. Agreed to let the Trustees of the Grey-Coat-School have a large House belonging to the Parish Rent-free or Seven Years; which Grant has been renewed for the Reception of as many of the Parish-Children (with the usual Pensions given to their Nurses) as the Trustees would undertake to maintain and employ with Work. At first the Trustees took in the 50 Boys belonging to the Charity-School, and at several Times afterwards so many Boys and Girls as have sometimes increased the Number of Children to above 130, which is the Number of them at present, including those on the Parish Account, and have set them all to work; some upon spinning of Wool; others upon Housewifry, sewing, knitting, &c. And the incomes of the Charity, with their Earnings, are applied towards finding them in Diet, Lodging, and other Necessaries; The Management whereof succeeded so well, that, in order to lay a more solid Foundation for its Support and Maintenance, Her late Majesty was pleased, in the 5th Year of Her Reign, to Incorporate the said School, and to make the Trustees One Body Politick, by the Name of, The Governors of the Grey-Coat-Hospital in Tothil-Fields, of the Royal Foundation of Queen ANNE. ...it may be observed, that 130 poor Children of this Parish are not only instructed in the Principles and Duties of Christianity, but also in the Means of getting a Livelihood by their own Labour, and entirely Cloathed and Maintained; to which, adding the Maintenance of the Steward, Matron, and ten Servants, necessary for keeping the House in Order, the Persons being in all 142, the whole Expence comes to 6l. 17s.3d. per Annum, or about 2s. 7d. ½ a Week each, exclusive of the Profits by their Labour; which, according to the above Computation, reduces the Charge to about 2s. 5d. a Week for each Person. Their Weekly Bill of Fare is much the same as in other Houses. And as a Proof of the great Benefit of this Hospital to the Parish, there has been put out at the 10th of January 1724-25. since its Foundation, to Apprentiships and Services 391. And those who have had Servants from it, have given this Testimony of the good Fruit of the Habit of Industry acquired by the Children here, that they would much rather take a Servant from hence for nothing, than to have Money with one from those Nurseries for Children, where there is no Work added to their Learning. In 1726, St Margaret established a workhouse in a hired house near the Great Almonry (or Almnery). Its operation was also described in An Account of Several Workhouses..., in a report dated September 22, 1731. THIS being a large Parish, very much burthen'd with Poor, the Church-Wardens and Overseers resolved to imitate their Neighbours, by collecting the Poor into one Family, to be helpful to one another, and employed in something they were most capable of. Accordingly in the Year 1726. they hired an old large House and Garden, formerly occupy'd by Sir Robert Pye, near the great Almonry, to which they added a new brick Fabrick, for receiving the Spinners and other Workers, and at Michaelmas the same Year opened it for this use. There are now 326 Persons in Family, of which about 200 are Children; they who have formerly lived in good Circumstances, and now decayed, are lodged in the better Apartments, and the common Poor in such as are very clean and comfortable. The old People pick Ockam, the Women that are able spin Jersey, and Mopp Yarn, some spin Flax for Sheeting and Shifts, while others knit Stockings for the House. The Children are taught to Read, to say their Catechism, and spin Jersey or Mopp Yarn. They are allowed 2d ½ per Pound for spinning Jersey by a City Trader, the other Wool Spinners have a Penny in the Pound for what they spin, to encourage their Industry: And a pound of Flax spun fine, will weave an Ell and Half of three Quarters end Nail wide Linnen. An Ell of good strong Linnen Cloath made here will cost about 8 Pence Farthing. The Humanity shewn in this House deserves to be noted, for among so great a Number of Poor, many art sickly, or have brought upon themselves the foul Disease, which are well nursed and provided for in an Infirmary taken at a little distance from the Workhouse. A Lunatic that had been discharged out of BedLam as an incurable, has a Brick Cell built on to for him, and such as may hereafter in the like Circumstances want it. The Overseers visit the House every Week, and are frequently honour'd with the Company and Advice of some active Justices of the Peace, who live in the Neighbourhood. THE Parish of St. John the Evangelist, newly taken out of this Parish, hath the Benefit of sending their Poor to this House, and contribute to the Support of it, the Poor of each Parish, by Act of Parliament, remaining on the same Foot, as they were before the Parish of St. Margaret was divided. A workhouse continued in operation in this area, with premises being located at the west side of Little Almonry from at least 1726. By 1787, the workhouse occupied a large area at the west side of what had then become Dean Street — this is now the site of the government's Department of Trade and Industry at the corner Great Smith Street and Victoria Street. Its location is shown on the map below from around 1830. St Margaret & St John — Dean Street site, c.1830. In 1751, the parishes promoted a parliamentary Local Act to (25 Geo.2 c.23) to place the administration of poor relief into the hands of a body known as the Governors and Directors of the Poor. In 1776, the workhouse could accommodate 420 inmates, who were occupied in spinning jersey and flax, and knitting stockings. Several were employed as nurses. The Local Act status of St Margaret and St John meant that the parishes were largely exempt from the provisions of the 1834 Poor Law Amendment Act. By the 1840s, the Dean Street buildings had become very dilapidated and the Westminster Improvement Commissioners demanded their demolition as part of a scheme to create Victoria Street. However, a new site in Westminster proved impossible to find and the Commissioners offered to fund the erection of two new workhouses. The first, to accommodate 650 inmates, was at a site to the south of the St Mary Abbots workhouse at Marloes Road in Kensington. The second, on the site of Vandon's almshouses on York Street (now Petty France), was to provide casual wards and some accommodation for the sick. The Dean Street workhouse continued in operation until its closure and demolition in 1852. Purchase of the Kensington site went ahead in June 1851 and the following month a committee was set up to obtain plans and to visit other recently built workhouses. The committee eventually chose a stripped-down Italianate neo-classical design submitted by HA Hunt who had advocated "Simplicity of Arrangement, Complete Classification and Inspection, and finally perfect Ventilation, both natural and artificial". The layout of the site (together with that of the Kensington St Mary Abbots workhouse to the north) are shown on the 1869 map below. The workhouse site was somewhat long and narrow and the arrangement of the buildings reflected this. The main building comprised a long three-storey block with separate areas for the different classes of inmate. The cross wing at the west contained the chapel, while that at the east included accommodation for eight married couples. To the rear, forming the northern border of the site, was a long single-storey parallel block which contained the dining hall at its centre, flanked by various utility rooms. These included kitchen, scullery, larder, bread-store, boiler-house, and coal-store. At the women's side to the east were a wash-house, laundry, mangling room and drying room. On the men's side to the west were tailor's, shoe-maker's and carpenter's workshops. A separate block containing the infirmary and lying-in wards stood at the south-east of the main workhouse. The south of the site was laid out to gardens. St Margaret & St John's workhouse plan. At the west of the site, facing onto Wright's Lane (later Marloes Road) Hunt had introduced the relatively novel feature of separate children's accommodation "by which the contamination of evil habits and bad language is avoided, and an opportunity given for that moral training, which in due time will be the means of rescuing the offspring of the pauper population from their hitherto degraded position, and of fitting them for a faithful discharge of those social duties which in all probability their parents have either neglected or despised." The children's block contained the workhouse entrance — an archway large enough for a horse and cart to pass through — together with the porter's lodge. The boys' schoolrooms and accommodation were in the north wing, the girls' in the south. St Margaret & St John's children's block from the west. The firm of George Myers of Belvidere Road, Lambeth, were appointed as contractors for the new buildings which was completed in March 1853. The final cost of the building work was £21,294. On top of this came bills of £691.7s.6d. for baths, cooking apparatus and kitchen fittings, plus £70 towards the cost of a new sewer being installed by the Kensington Guardians. The new workhouse was unusually well appointed for its time in having a mains water supply provided by the West Middlesex Water Company. Facilities for the paupers included 16 baths which some of the Guardians thought rather excessive for 650 inmates. Gas lighting was also installed in the workhouse, using apparatus supplied by Henry Lewis at a cost of £278. Apart from the workhouse Master, Edward Brockinshire, and Matron, Eliza Burridge, other staff of the workhouse included a chaplain, schoolmaster, schoolmistress, cook, porter, two nurses for the sick, and a nurse for the children. The schoolmaster, who resided on the premises, was responsible for not only the boys' teaching, but also their entire management and discipline from their getting up in the morning to their going to bed at night. Similar duties were required of the schoolmistress who, as well as teaching her charges, was expected to train them in skills such as needlework that would equip them for a life of domestic service. The surgeon is at feud with the attorney; the master with the matron; the matron with the schoolmistress; the Board with the master and the schoolmaster. The surgeon provides himself gratuitously with the services of a workhouse boy, who reports his son to the schoolmaster for showing him indecent prints, upon which the surgeon sends him back and denounces him as a "canting, hypocritical, dishonest boy." The schoolmaster thereupon publishes a pamphlet reflecting scandalously, and, as appears, untruly, on the surgeon's son. Then the schoolmistress charges the matron with abstracting three hams and some tea and sugar. When one of the female inmates dies, the master threatens the matron that he will demand an inquest. When the schoolmaster's wife has a relapse after her confinement, the matron withdraws her servant, "by order of the Board," and leaves the woman to the tender mercies of the chaplain's wife, who is kind enough to stay by her, and act as her servant, whether the Board likes it or no, like an honest Christian woman, Never was such an unhappy family of officers, from highest to lowest — from the Board to the surgeon's errand boy, only two persons seem to have dwelt in harmony — namely, the matron and Mr. Todd; the chairman of the Board, who, in the midst of this acrimonious hubbub, is found soothing the cares of office with a tumbler of gin-and-water at the matron's expense. One incident in particular received considerable publicity. The schoolmaster's wife, Mrs Bernell, claimed that the matron, Mrs Burridge, had tried to poison her. One dinner-time, during the previous November, she had been handed a plate of meat by the matron which had some white powder at the edge. Becoming suspicious, Mrs Bernell had commented upon the powder, at which point, she claimed, the matron had gone pale and become confused. The powder was transferred to an envelope and later analysed by a chemist who pronounced it to be pure arsenic. The Poor Law Board inquiry, chaired by an Assistant Commissioner, Mr Farnell, revealed that Bernell's husband kept a stock of various chemicals but not, the Bernells said, arsenic. It also emerged that complaints had been laid against Mrs Bernell over supposedly immoral books such as The Woman of Pleasure and Aristotle which she had loaned to the workhouse's young schoolmistress. Despite the apparent seriousness of Mrs Bernell's poisoning accusation, no legal action had been instigated by her. Following the inquiry, the surgeon and the matron were peremptorily dismissed by the Poor Law Board, under circumstances of great ignominy. The then chairman of the committee for the Kensington house resigned his office, some damaging evidence having been produced against him. In 1865-66, the medical journal The Lancet published a series of reports into the conditions at a number of London workhouse infirmaries. Its report on the St Margaret's and St John's workhouses found a great deal to criticise. Inspection of the workhouses by members of the Board of Guardians did not take place on a regular basis. The infirmary was overcrowded and badly ventilated, the glass in its windows was inexplicably fitted with frosted glass, and one of the wards suffered the daily noise of inmates stone-breaking outside its windows. Some of the waterclosets were badly maintained, and none was provided for the nursery. There was no regular night nurse in the infirmary and patients were locked in at night, with no fires or hot water, and no bell to summon help if needed. As a result of The Lancet campaign, and pressure for improvements from individuals such as Florence Nightingale, the Poor Law Board undertook its own review of the conditions in workhouse infirmaries. The outcome, in 1867, was the passing of the Metropolitan Poor Act which initiated major reforms of London's workhouse system including the setting up of the Metropolitan Asylums Board (MAB). In 1868, the MAB set up six new Sick Asylum Districts for the purposes of providing hospital care for the poor on separate sites from workhouses. One of the new Districts, named Kensington, comprised the parishes of St Margaret and St John, Westminster, together with St Mary Abbots, Kensington. However, the large new hospital required by the new scheme was felt to be too expensive and the Kensington Sick Asylum District was dissolved. Instead, St Margaret and St John joined St George, Hanover Square to form the new St George's Union. St George's continued to use the former St Margaret and St John workhouse at Kensington until 1878 when its inmates were transferred to the union's newly extended Fulham Road premises. 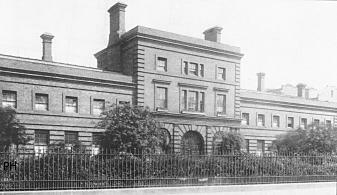 The Kensington workhouse was then briefly leased to the Kensington and Chelsea District School Board for accommodating pauper children. However, the St Mary Abbots Board of Guardians were keen to acquire the buildings as an extension to their adjacent site. This eventually took place at the end of 1880. All the former St Margaret and St John workhouse buildings have now been demolished. St Margaret & St John - York Street site, c.1862. has been found so entirely unfit for the management of severe cases of disease that, in fact, it frequently happens that patients who are seriously ill are transferred from it to the Kensington house. Careful inquiry from more than one authentic source convinces us that great cruelty has frequently been shown to these poor sick creatures in the manner of their removal. We understand that not long since an aged sick woman of ninety-three years was put into a common van along with nearly twenty other persons, and jolted across to Kensington, where she arrived nearly dead from exhaustion. The report further noted that the building, although of fairly recent construction, had been "condemned as thoroughly unfit for its purposes, and is to be pulled down." This appeared to have taken place not too long afterwards. City of Westminster Archives Centre, 10 St Ann's Street, London SW1P 2DE. Holds extensive parish records prior to formation of St George's Union including: Churchwardens', overseers' and governors and directors of the poor minutes (1752-6); Governors and directors of the poor minutes and reports (1824-1868); Settlement certificates (1708-30, 1753); Registers of passes (1713-66, indexed 1729-66); Vagrants' passes (1752-88); Workhouse minutes (1726-52, indexed 1730-1749); Workhouse building minutes and reports (1805-28, 1831, 1842, 1851-6); Workhouse building accounts and papers (1851-1877); Workhouse rules (1742); Workhouse diet (1801); Workhouse admission and discharge registers (1843-7); Workhouse inmates lists (1747-8); Workhouse general reports on paupers' work (1752-63); Workhouse accounts (1692-1815, 1850-61); Workhouse visiting committee report (1854); Appointment of workhouse masters (1624, 1655, 1852-5); Expenses of contractors for employing the poor (1606-7); Charities' lists of paupers (1678-1875); Apprenticeship registers (1606-34, 1767-92); Apprenticeship indentures (1648, 1666, 1692-3, 1696-7, 1703, 1712, 1718-99); List of children at the Grey Coat Hospital (1705); Accounts for nursing (1773-9 — nurses indexed); Lists of nurses (1792, 1795 — alphabetical); etc. St Margaret's workhouse holdings include: Baptisms register (1863-76). Survey of London by RCHME. From Workhouse to Hospital by Revd Bernard Hughes (1991).